I rather doubt that Barrett would disagree about the power of God’s Word. I think he and I would probably agree on that issue. I’m just not as convinced that his opinion should become a black and white standard for all pastors/preachers. I’ve had numerous conversations with people about Jesus, the Gospel, and my faith as a direct result of reading Scripture right on my iPad. 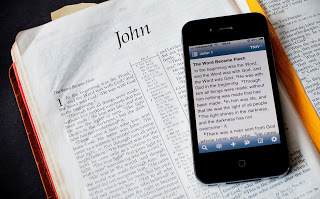 I’ve also seen a great host of people move from using their digital devices primarily for entertainment purposes to begin using them to read God’s Word more. Furthermore, I’m convinced that John Piper’s statement that “the Bible is about to threaten your smartphone focus” was spot on.